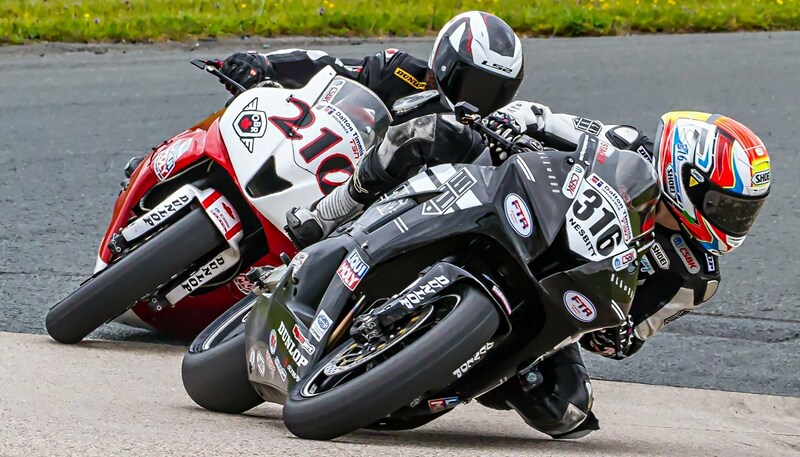 July 14-16, Atlantic Motorsport Park, NS saw the 2017 Canadian Superbike Championship return to the east coast for rounds 4 & 5. In the Saturday morning warm up Stacey focused on improving specific areas of the track rather than lap times. 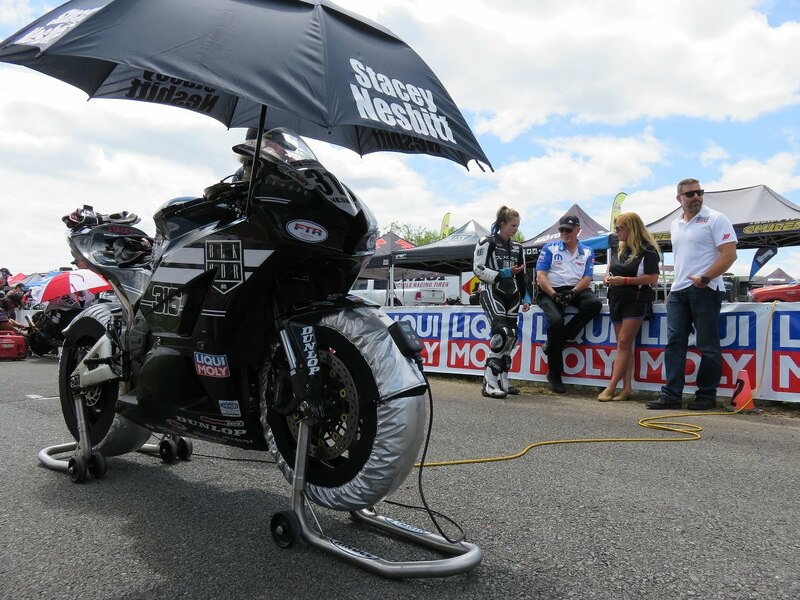 At the start of Liqui Moly Pro Sport Bike race one Stacey gained one position on her BLKRDR by Motovan/FTR CBR600RR which quickly became as two way battle for third. This in turn opened a gap to the next group. Stacey would eventually cross the line 5th. She improved her lap time from qualifying by a second. 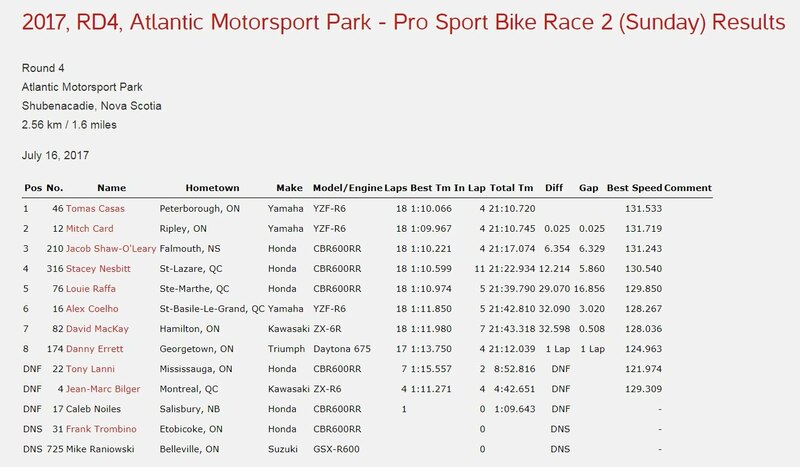 This was significant because a new rule this year in CSBK sees the grid for race two based on the lap times from race one. Stacey had the 5th fastest lap so another row two start for Sunday’s race. “I was pleased enough with how the race went” said Stacey. “We are making progress in each session and getting closer to the pace”. She sat out the Saturday Mopar Pro Superbike race and save her energy for Sunday’s races. Sunday morning was cloudy and rain threatened but it held off. 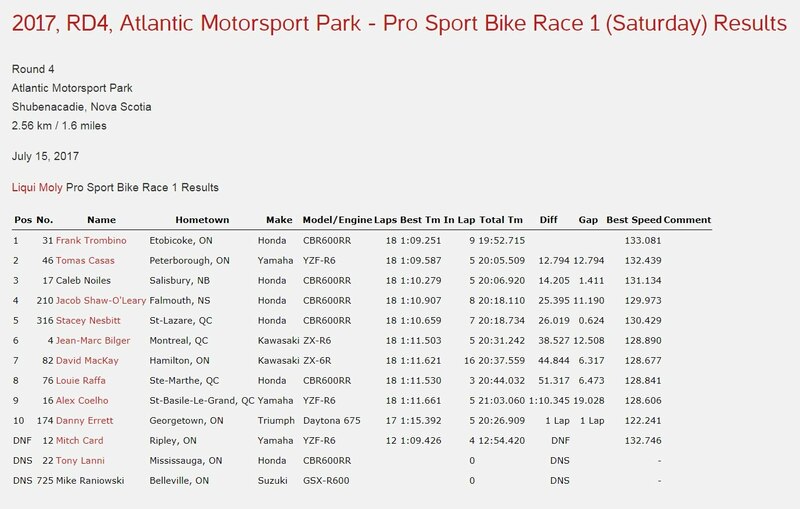 Stacey got a better start in Liqui Moly Pro Sport Bike race two and moved up to 3rd. This time she stayed with the leaders. and by mid-distance she was still within a couple of seconds. “Jake got by on the back straight. I was able to stick with him and we were starting to close a bit on the two leaders again. Unfortunately I hit a false neutral going into turn one about four laps from the end and lost two seconds right there. I was lucky not to run off the track and crash but I think the spectators were entertained! It was too much to make up in the remaining laps so I decided to bring it home for a safe 4th. I must admit though I was disappointed not to get on the podium“ said Stacey. In the Mopar Pro Superbike race Stacey did only a handful of qualifying laps so she was starting from the back of the grid. She got a good start and moved up to 12th. This became a terrific four way race long battle for 11th between two superbikes and two 600s. Unfortunately it ended after she was tagged in turn one. Stacey and another rider crashed bringing out the red flags. Fortunately neither was too seriously hurt. “It was a racing incident, just one of those things. It was a good race up to then but not the best way to finish. I had a good weekend overall though. I am happy with the progress and feel I am getting back to the pace I know I should be at. Roll on Mosport” said Stacey. 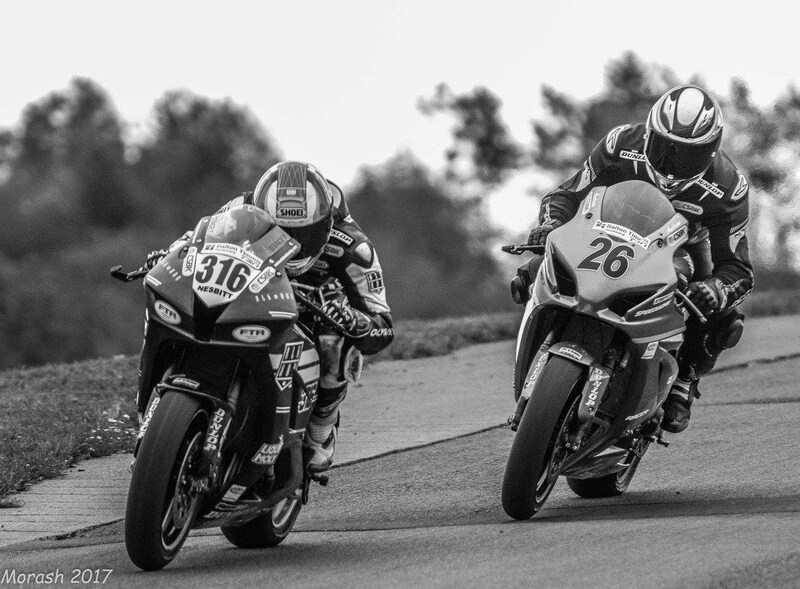 The final round is another double header at Canadian Tire Motorsport Park, ON, August 18-20.